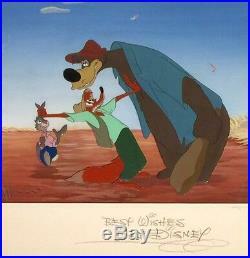 BR'ER FOX, BR'ER BEAR, AND BR'ER RABBIT PRODUCTION CEL ON PRODUCTION BACKGROUND; SIGNED WALT DISNEY WALT DISNEY STUDIOS GOUACHE ON CEL & WATERCOLOR ON BOARD, 1946. Original hand painted and hand inked production animation cel of Br'er Fox, Br'er Bear, and Br'er Rabbit set on an original hand painted production background from "Song of the South, " 1946, Walt Disney Studios; Courvoisier Setup; Studio signed "Best Wishes Walt Disney" (presumably Hank Porter); Framed using a wood frame, two mats, wood fillet, and Museum Perfect UV glass. I'm gonna knock his head clean off. "Song of the South" from 1946 is a live-action/animated musical film produced by Walt Disney and released by RKO Radio Pictures. It was based on the Uncle Remus stories collected by Joel Chandler Harris. Harris created the character of Uncle Remus in 1876 and began writing the Uncle Remus stories as a serial series to, in his words, preserve in permanent shape those curious mementoes of a period that will no doubt be sadly misrepresented by historians of the future. " President Teddy Roosevelt said of Harris, "Presidents may come and presidents may go, but Uncle Remus stays put. Georgia has done a great many things for the Union, but she has never done more than when she gave Mr.
Joel Chandler Harris to American literature. "Song of the South" was Disney's first feature film using live actors, who provided a framework for several animated segments throughout the film. The character of Uncle Remus, who was presumably a former slave, was played by James Baskett. The film includes several folk tales of the adventures of anthropomorphic Br'er Rabbit and his enemies, Br'er Fox and Br'er Bear. The film's song "Zip-a-Dee-Doo-Dah" won the 1947 Academy Award for Best Song, is used often by both Disney and in popular culture. The film inspired the Disney theme park water log attraction, Splash Mountain. Because of the film's depiction of black former slaves and of race relations in Reconstruction-Era Georgia; the film has been controversial since its original release. A number of critics, both at the time of its release and in later decades, have described the film as racist. Consequently, "Song of the South" has never been released in its entirety on home video in the United States. Br'er Bear is slow-witted (compared to Br'er Fox and Br'er Rabbit) and prone to violence when provoked. He is gullible which leaves him open to being tricked repeatedly by Br'er Rabbit, even when he accompanies the more sly Br'er Fox. Br'er Bear is a tall grizzly bear, with brown fur, a cream muzzle, large black nose, wearing a blue unbuttoned dress shirt, and a red fedora. He may be one of the most cruel and heatless of all the Disney villains. And, in referring to Br'er Rabbit, his most memorable quote is I'm just gonna knock his head clean off! Br'er Bear was animated by Marc Davis, Ollie Johnston, and Eric Larson and was voiced by Nicodemus (Nick) Stewart, who was an American television and film actor. Stewart was best known for his role as Lightnin' (Willie Jefferson) on the "Amos and Andy" television show. Br'er Fox is the fast talking sly fox who is always trying to trick and trap poor Br'er Rabbit. Br'er Fox has red fur, sharp teeth, a yellow-green hat, pale white shirt, and a forest green vest over a pair of green pants. Br'er Fox and Br'er Rabbit were animated by the great Walt Disney animators Marc Davis and Ollie Johnston. Johnny Lee (an African-American singer, dancer and actor) provided the voice of Br'er Rabbit and Br'er Fox was voiced by James Baskett; who also was the star of the film portraying Uncle Remus. In recognition of his warm portrayal of the famous black storyteller, Baskett was given an Honorary Academy Award; making him the very first black male performer to receive an Oscar. At least a dozen different Walt Disney Studio staff members signed Walt Disney's name to a variety of items including: comics, fan items, and promotional materials. However, original artwork that was presented to VIPs was signed by an authorized individual; and Hank Porter was the first to be authorized to sign Walt Disney's autograph, instead of Walt Disney himself. The most common proxy signatures that exist on artwork are by Hank Porter in the 1930's & 1940's, and Bob Moore beginning in the 1950's. Hank Porter (1900 - 1951) was a member of Disney advertising artistic service that was part of the Publicity Art Department from 1935 to 1950. He made adaptations, for the Sunday pages of American newspapers from 12 December 1937 to 24 April 1938, of several feature films including "Snow White and the Seven Dwarfs" and Pinocchio. " Both David Lesjak and Didier Ghez have profiled Hank Porter on their blogs: "Porter was a really interesting guy, and a wonderful artist. Porter was a staff artist of the Publicity Art Department from 1936 to 1950. He is the artist of the Sunday pages with the movie characters'Snow White and the Seven Dwarfs' and'Pinocchio'. Snow White and the Seven Dwarfs' appeared in the Sunday pages of the American newspapers from 12 December 1937 to 24 April 1938. Note that the actual movie wasn't released until 27 December, so the comic began its run prior to the film's release. His'Pinocchio' Sunday ran from December 1939 to April 1940. The adaptations were written by Merrill De Maris and inked by Bob Grant. Porter also did several covers and illustrations for Mickey Mouse Magazine and Dell's Walt Disney's Comics and Stories. Walt also had Porter head up the World War II insignia unit, where in addition to supervising (and in many cases drawing) the more that a thousand insignia created by Disney, he also did a ton of other specialty drawing focused on the war effort. This is perhaps one of the greatest original production animation cels that exists from The Song of the South! Br'er Fox, Br'er Bear, and Br'er Rabbit are full figure, eyes open, and Br'er Fox and Br'er Bear are mouth open showing their sharp teeth. 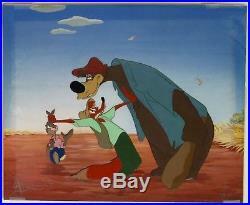 Br'er Rabbit has a wonderful sly smile and the cel has been placed on an original hand painted production background. The original Courvoisier stamped mat has been Studio signed "Best Wishes Walt Disney" (presumably by Hank Porter). The dialog for this scene from the film is below: Br'er Fox: No! Go on, knock my head clean off. Br'er Rabbit: But please don't fling me in dat briar patch. 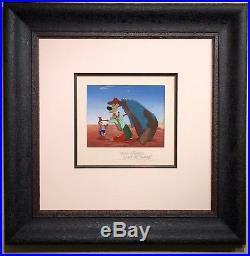 Measurements: Size - Br'er Fox, Br'er Bear, & Br'er Rabbit: 6 x 7 1/2", Image 8 x 10", Frame 31 x 31. 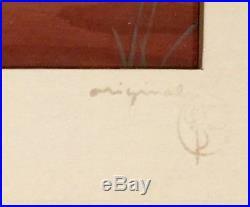 Condition: See pictures of the actual cel and background which are in excellent overall condition, as shown by the pictures above! All items we sell are from a smoke-free/mold-free home/workplace and are in excellent condition unless otherwise noted. I own every work pictured for sale and I stand behind every item. Please follow/bookmark me as a favorite and keep checking back for more items for sale in the coming weeks. For now, please check out my other Drawings and Cels and other original modern and contemporary artwork for sale! 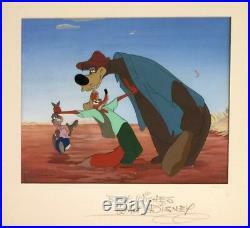 The item "1946 WALT DISNEY SIGNED SONG OF THE SOUTH ORIGINAL PRODUCTION CEL & BACKGROUND" is in sale since Tuesday, March 12, 2019.